I am not an apron kind of girl. I don’t do bows, frills, flounces, or flowers. But, I do like to cook. And if I am making something messy like buttermilk biscuits, paranthas, or alfajores–basically anything that involves working with dough and flinging clouds of flour around–I like to wear my grandmother’s apron. In a way, I never knew my ‘real’ grandmother. When I was 3, she and my grandfather were driving home from a livestock auction on a rainy winter night when their white pickup truck was slammed into by a tractor-trailer. They both survived, but my grandmother’s injuries were serious. She moved from intensive care to a regular ward to a nursing home. When she finally did come home, she was, as my mom would say, “not the same person.” She was listless, petulant, distant. After the accident, she mostly sat still in her chair in the front room of their log cabin, beside the Franklin stove. A look through family photo albums shows the lost woman my mom was missing. Grandma in a man’s winter coat and rubber boots, carrying a rifle, heading off squirrel hunting with her sister. On vacation, waist-deep in the Chesapeake Bay. Leading my 5-year-old mom around the barnyard on the back of a Holstein calf. Her white hair tucked under a hunting cap, riding on her Saddlebred mare, Sugar. She was a Yankees fan, a backyard geneticist (chickens! ), and she eloped with my grandfather–a German sailor who had jumped ship in New Orleans and made his way north–and for months didn’t tell anyone in the family that she was married, just kept bringing her beau to Sunday suppers with the family. I don’t remember a single photo of her wearing a skirt or dress – quite an accomplishment for a woman born in 1910. Pauline was the second youngest of nine children born on a farm. The boys worked in the fields and the girls worked in the house. That’s just the way it was. She was a good country cook, and she cooked for her German sailor, too: fried chicken, chipped beef, potato salad, coleslaw, fruit cake, peach pie. 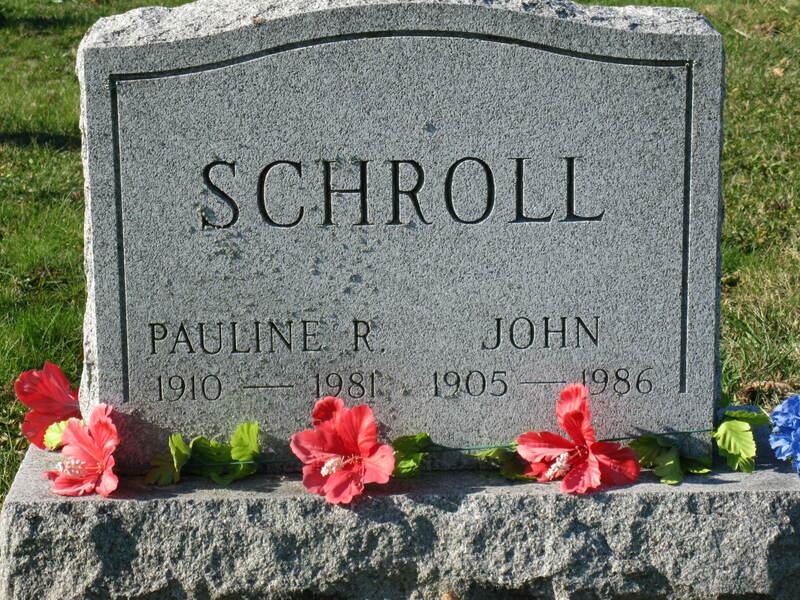 We spent a lot of time with my grandparents, especially after the accident, when we moved next door to help take care of them. I was always happy to visit– My grandparents were glad to see me, and they ate food that we didn’t have at home. There were packages of Nutter Butter cookies for my grandfather, and bags of chalky pink peppermints. There were cold slices of squirrel and rabbit refrigerated in margarine tubs, that we ate with Blue Ribbon margarine on Roman Meal bread. There was Braunschweiger and sliced genoa salami. Their dirt-floored cellar was a treasure house of canned peaches, pears, and fruit cocktail, jars of cinnamon-sugar applesauce, and big cans of Hi-C from the canning factory where they used to work. 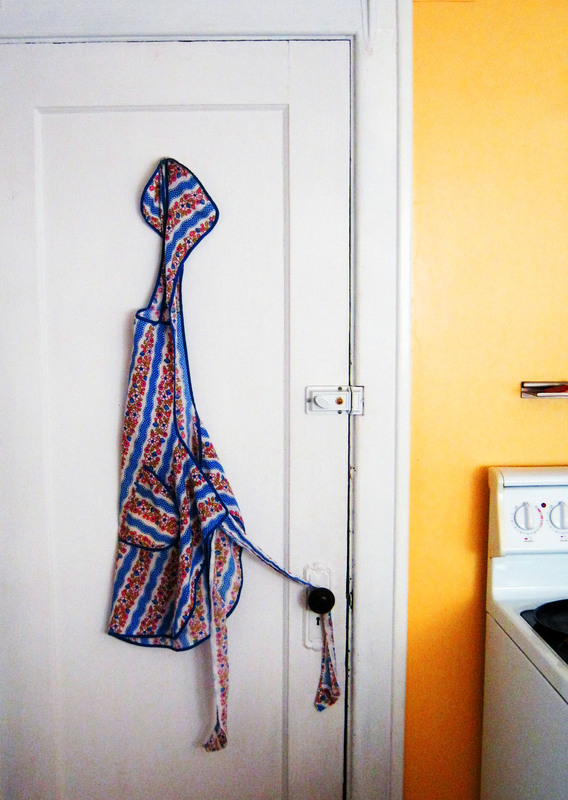 And down behind the white Westinghouse fridge, where they kept six-pack glass returnable bottles of Coke (for Grandma) and Pepsi (for Pop-pop), was a flowered vinyl shopping bag, and two aprons – one red, one blue, hung on a hook. I don’t like sports. I’ve never been hunting–I’ve been a vegetarian since I was fifteen. But, I, too, ran off and married my husband –another foreigner–and called my mom to tell her the news after the fact. I learned to ride before I can remember, and the feel of a horse under me is as natural as walking. The cooking thing skipped a generation. My mom didn’t learn to cook until her husband taught her, and when he died when I was eight, I took over the cooking. It wasn’t until I had grown up and moved out and was visiting my mom, digging for some cobwebbed necessity when trying to make Christmas dinner in her neglected kitchen that I came across my grandmother’s apron. It all came back to me. My whole childhood. My grandfather’s bolo ties, and his snoring in his armchair in front of the Orioles game. Eating squirrel sandwiches at the claw-foot table in the kitchen. Feeding the chickens, and stroking the feathers of the pale gold spring peeps. Sledding down the mountain lane in winter, and scrambling barefoot up trees in the summer, gathering black raspberries by the bucketful and spooning them with sugar over vanilla ice cream. Riding my Shetland pony, and falling under her feet when the girth slipped on her grass-fat belly. Crawling through barbed-wire fences, watching out for copperheads, playing tag with my cousins. Eating sassafras leaves, birch bark, and teaberries, and ‘cooking’ grass and acorns in a beat-up old saucepot on the tar-paper roof of the springhouse. My mom didn’t need the apron, and I took it with me. When I wear it, I know the Pauline who I never knew. When I wear it, I continue the best of the women in my family. Women who know the Appalachian woods from the inside, who ride horses without fear, who marry the men they love, and ask permission later. Categories: Uncategorized | Tags: Alisa Alering, Appalachia, Aprons, Cooking, DPchallenge, Elopement, Family, Grandmother, History | Permalink. 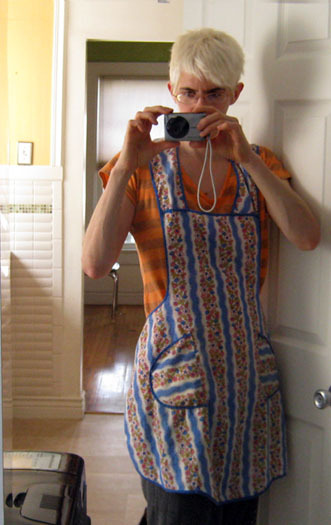 I use an apron my grandmother made, all crazy quilt style. No frills or ruffles, but plenty of strange fabrics which I saw repeated in some of the full-size quilts she made. Slinging it on as I make dinner always reminds me of her, and the other trials the apron has gone through. We lived in Colorado while my mom’s family was in California, so I only got to see her a few weeks a year (my grandpa was already dead by then), and I was too involved in all the summery kid stuff to spend much time with her. I do remember making cheese straws with her, the day before we left for home. May have been the same day she gave me the apron. Who knows? Then she got sick and passed when I was a teenager, and too self absorbed to go to the funeral. Haven’t thought about that in a while. Thanks for the lovely post. Also, your hair looks wicked cool. Love the story about the apron. So nicely written, bringing back my memories, some similar. I LOVE aprons – just got re-hooked on them. Made several from dish towels and embellished them with a strip of three pockets across the front. So handy. I gave EVERYONE aprons for Christmas last year – even grilling ones for the guys. Each has special messages at the top. There were a big hit, even with the guys. Frills for little girls and G-Ma, practical ones for all else. Heavy fabric. I wear mine a lot now. Saves getting grease spots out of clothing, and saves on clothing bills. Nice! Thanks for the lovely, warm article, and thanks for the above comment. Congrats on being freshly pressed. That is such a beautiful post, Alisa! I wish I had something like that of my grandma who was such a great cook! When I was a kid, my grandparents’ house meant freedom to me. Freedom to do nothing. Freedom to demand delicious food, and have it made in a jiffy. Freedom to let them spoil me. I still do. Its something I can never forget. Lovely post. Congrats on being freshly pressed. This is a fantastic post! I loved reading it. I think you were completely successful with the writing challenge. Beautifully written and your grandmother sounds like an amazing woman. This post was wonderful! Made me a bit tearful, your grandmother sounds like a fabulous woman. “There were cold slices of squirrel and rabbit refrigerated in margarine tubs…” weren’t those the original tupperware? Great stuff, thanks for sharing! I am one of the fortunate who feel they have been given a gift with your prose today. Thank you, “Freshly Pressed”, for featuring you and your beautiful voice. This just sings. I have my grandmother’s breakfront cabinet as well as a picture she embroidered. I like to think that some part of her spirit travels along with me with these items. Great post! I like looking into coffins (er, family history) with you. And aprons make excellent remembrances. I’m glad you can wear it. Alisa, that is odd. Even odder than you said. Now I’m sure it’s the elopement-and-hunting moon. And there are even more invisible cross-post links than elopement-and-hunting. The whole business of cooking for your mother: that was Michael also. The cooking and the generation skip: he learned how to cook and bake from his Gran, who was pretty darn colorful–I’ve only known one other woman who talked that much! She was half French Canadian and half Mohawk, and she married an Irishman who was a border rum-runner. (They housed Dutch Schulz when he went North for his trial.) And the grandmother’s aprons. Those quilts in my posts? He started by cutting up his grandmother’s aprons and making quilts that way. FABULOUS. I loved this, thank you. I’m sure when you wear your grandmother’s apron she’s right beside you cooking! Beautiful post. I love aprons, but never wear one. Yah, go figure. And I loved this story of your growing up and your grandmother. I love this post! You write beautifully, and I was emotionally pulled in. Thank you so much for sharing your story, and I’m so glad it was Freshly Pressed so I could enjoy it! Congrats! Great post, Alisa. As they say, you can’t keep a good woman down. When we were going through my Nanny’s things I asked for her blue natty gardening sweater – that sweater was her, and I like to wrap myself in it. I, too, appreciate well-used things the best. From my grandfather (the German sailor) — who I knew better and for longer than my grandmother — I kept two nearly-worn-through yellow plaid summer shirts that he used to wear with the bolo tie. They used to be regular wear for me in summer, but now they are too fragile–still, I can’t get rid of them. So evocative! Your grandmother was very vivid and she sounded like an amazing woman. I’m sure it’s great to feel you’re following in her footsteps. Love hearing about faraway landscapes too, and I totally get the riding thing – though I haven’t done it for a while! Same with me on the riding. It’s been at least five years since I’ve even sat on a horse, but it’s so ingrained that I can access the muscle memory in a heartbeat. Glad you liked the post. Thanks for stopping by. What a great way to paint a portrait of your grandmother! What a creative way to weave a tale of family history. Very enthralling! Congrats on being freshly pressed. Keep writing and exploring. I clicked onto this post thinking it would just be something perhaps about making aprons, or about cooking (I admit I ignore the little tag beneath the headlines that tells you the topic, I’m just wild that way, what can I say) and I was pleasantly surprised to find this actually, really heart touching post. It had the perfect balance of detachment and warmth. The ending made me feel like I knew the women you speak of, as if they were from a forgotten story; it made me want to say something involving the phrase ‘I could almost smell them on the wind’. So, you’ve definitely stirred up something in me, even if it does involve creepily smelling things on winds. Sorry about that. Thanks! Glad you like the photo. When I wrote the post, I realized that I didn’t have a single picture of my grandmother or the log cabin farmstead and had to run down to the kitchen for a hasty photo shoot.